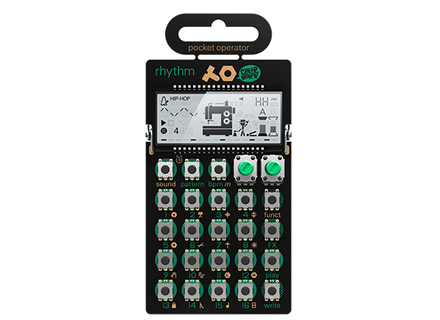 PO-12 Rhythm, Drum Machine from Teenage Engineering in the Pocket Operators series. Last year, Teenage Engineering unveiled a new project of affordable pocket-sized modules. The team introduces today the final result at NAMM 2015. The Pocket Operator Series debuts in Anaheim with three ultra compact modules, respectively a drumbox and sequencer (PO-12, the prototype announced last year), a bass synth and sequencer (PO-14) and a melodic synth and sequencer (PO-16). 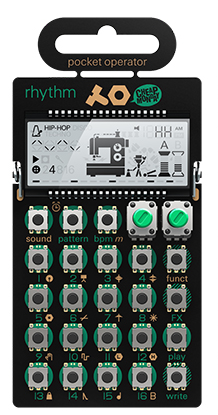 All these pocket modules feature a 16-step sequencer with 16 patterns and chaining option, 16 filters (delays, bit crusher and filters), an auto-compressor, a hardware limiter, a parameter lock function, a clock, an alarm clock, a jam sync function with audio thru, an LCD display, 1/8” audio in and out and a folding stand. The PO-14 combines FM, subtractive, wavetable, and physical modeled string for 16 bass oriented playing styles. the PO-16 also combines multiples synthesis and offers 16 arpeggios and chord styles. Each module has a two-year warranty and is available for $59 / 59 €. More info at www.teenageengineering.com. [NAMM][VIDEO] Sequential Prophet 6 Demo Red Led from the Audiofanzine team met Dave Smith in person for a little chat and a nice presentation of the Sequential Prophet 6 synth. [NAMM] Arturia unleashes BeatStep Pro The Arturia BeatStep MIDI controller and sequencer jumps into a new dimension with the new Pro version unveiled today at NAMM 2015. [NAMM] The Korg Kronos will ship in February Korg is showcasing on its booth at NAMM 2015 the new Kronos we talked to you about last November.